Sometimes a book finds you at just the right time, and it changes your life a little bit. This is that book for me. I used to be a very intense athlete--I worked under an Olympic world record holder--I trained, I competed, and I won, and eventually I stopped doing all three, in some non-numerical order. Now I stress about grad school. Reading this book was a salve for the me that wonders what could have been, and the me that now wonders what could be. 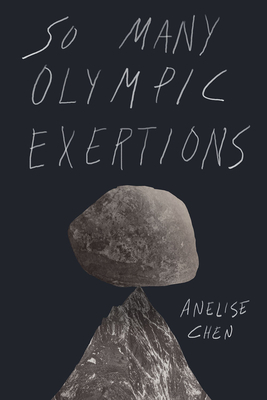 Blending elements of memoir and sports writing, Anelise Chen's debut novel is an experimental work that perhaps most resembles what the ancient Greeks called hyponemata, or "notes to the self," in the form of observations, reminders and self-exhortations. Taken together, these notes constitute a personal handbook on "how to live"--or perhaps more urgently "why to live," a question the narrator, graduate student Athena Chen, desperately needs answering. When Chen hears news that her brilliant friend from college has committed suicide, she is thrown into a fugue of fear and doubt. Through anecdotes and close readings of moments in the sometimes harrowing world of sports, the novel questions the validity of our current narratives of success.Anelise Chen earned her BA in English from UC Berkeley and her MFA in Fiction from NYU. Her fiction, essays and interviews have appeared in The New York Times, Gawker, NPR and elsewhere. She currently teaches writing at Columbia University.